The first time I ever entered an ethnic foods store was with my mother-in-law. We pulled up to a small shop in a strip mall I had been to several times, but I’d never before noticed the unassuming “Indian Grocer” placard among the other larger shop signs. Accosted by strange smells upon entering, I followed my mother-in-law into a world of unfamiliar foods that were labeled in foreign languages. I watched my mother-in-law as she shopped in this small store. She fingered little ziplock bags of spices and asked questions about soups and sauces. She collected spices and coconut milk. She bought a bag of rice in a size I did not know existed, again with writing scrawled across it that I did not recognize. 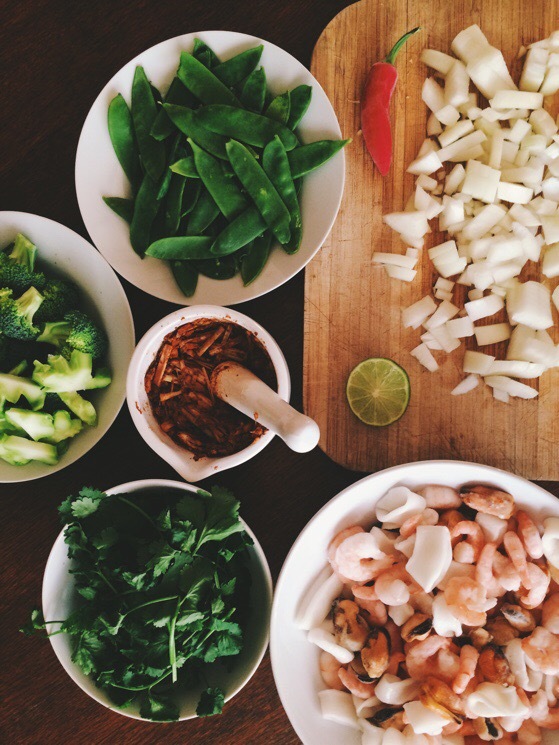 When I think about all the different influences in my cooking, I have to attribute most of my discoveries of curries and Asian foods to my mother-in-law. 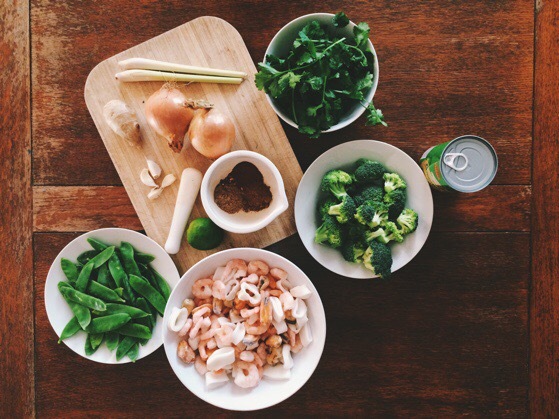 Coconut milk, fresh ginger and fish sauce are just a few of the ingredients I first experienced in her kitchen. I’ve also discovered many delightful dishes by following her (and her son) into restaurants I might have been nervous to go into on my own at first. We’ve had more curries together than I can count. Both Thai and Indian. And over time, I learned that when you find a dish you love in a restaurant, you can probably re-create it yourself at home. I think it’s a special gift of a great chef to be able to discern what’s in a dish just by tasting it. My sister possesses this ability, as does my mother-in-law. I don’t do it as often as they, but I’ve seen their taste buds at work and then heard them ask a few questions before heading to the store to get what they need to experiment with making something new. So every once in a while, I follow their example. 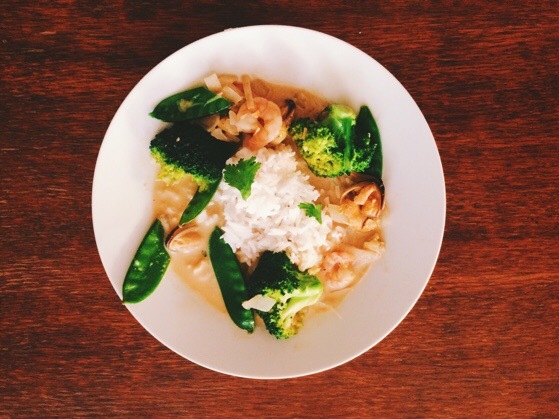 This seafood coconut curry is the result of one such occasion. My mother-in-law taught me not to be afraid of ingredients I’ve never used before. To hold lemongrass in my hand. To make friends with fenugreek and tumeric. And to love the explosion of flavors that is a good curry. I’m more than a little bit grateful for those gifts and for her influence on our dinner table. 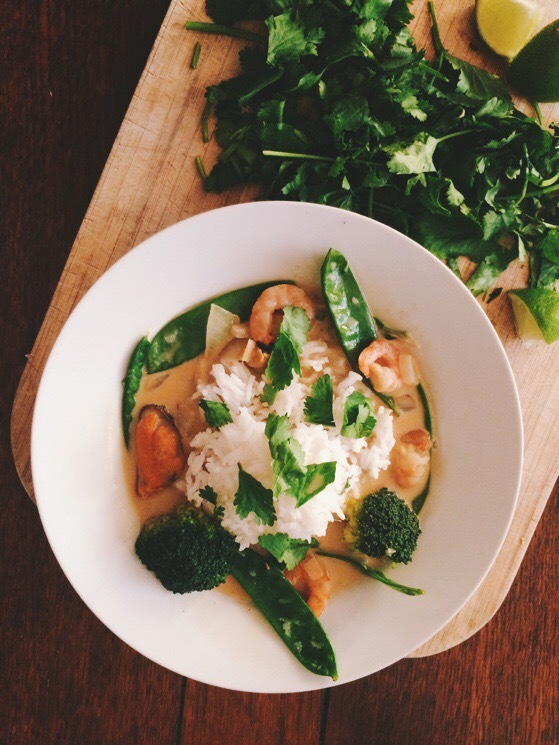 Seafood Coconut Curry recipe below! 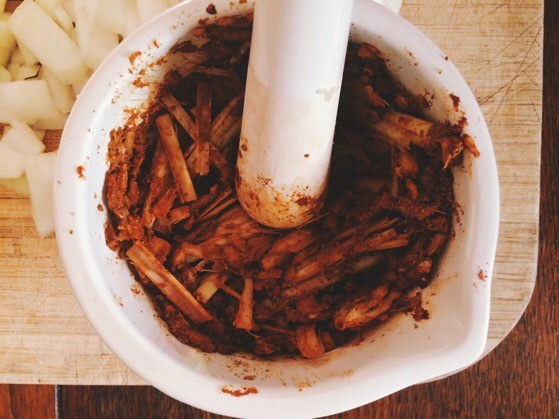 Make paste with a mortal and pestle or in a food processor. Mash all the paste ingredients together. Add more lime juice to make it come together a bit. Coat a hot wok or heavy-bottomed pot with paste and allow it to heat up a minute. Add onions and chili pepper (if using) and cook, stirring constantly for about 5 minutes. Add seafood. Cook for 1-2 minutes until coated with spice. Then add the cans of coconut milk and fish sauce. 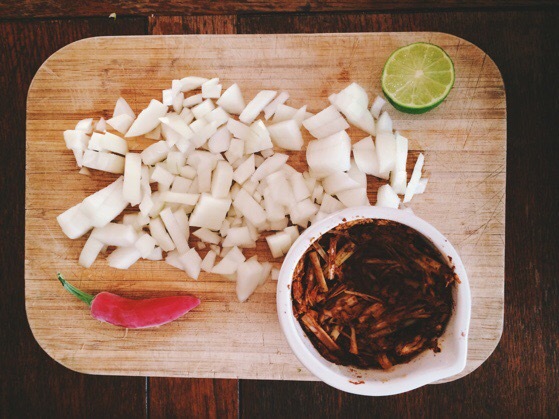 Serve with rice, fresh cilantro and wedges of lime. She sounds like a wonderful mother-in-law! What a treasure to experience. And definitely love the recipe!